The mount for the tiller pilot on the tiller itself blew up next. There’s a lot of force on TP, up to 77kg. I have it offset on the tiller because of the narrowness of Ashiki’s double ender stern means TP will be hanging out above the waves if it weren’t. Anyway, the broken pine mount was replaced by a sturdier hardwood version the next day, while on passage. Both mounts eventually blew up again, and both times replaced and reinforced, so far they have held. After a good 4 days in Cooktown we were lifting the anchor or anchors, since I dropped two of them, the holding is a little suspect here in the river. Also by hand, since the windlass lever fell over board somewhere in the Gulf and thusly the windlass has become a deck ornament. In a fair wind we quietly slid past Endeavour Reef. The place where an incident took place which could have been the knife edge turning point of Australia’s history, it could have gone either way. 245 years ago Captain Cook assumed the Great Barrier Reef had ended and made the decision to sail through the night. So he, the “greatest” navigator the world had ever seen, ran the ship up onto what is now known as Endeavour Reef and almost lost everything. 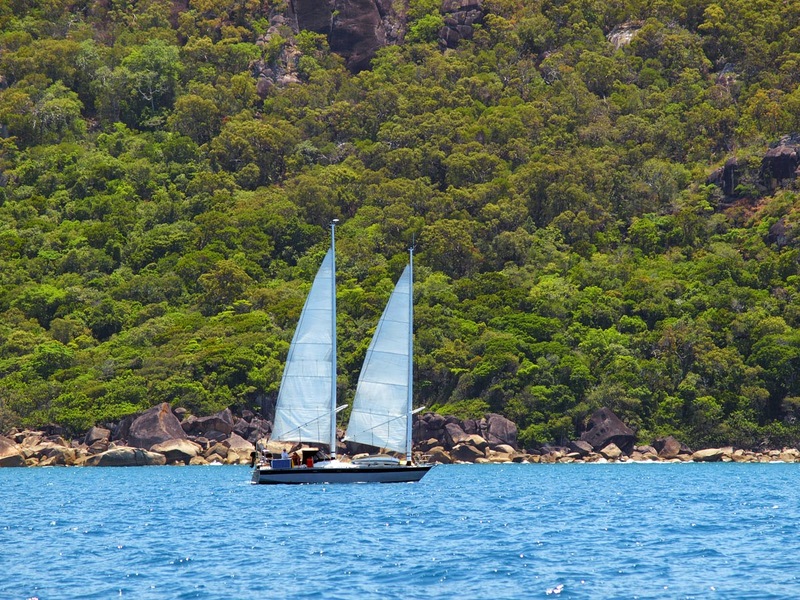 If he wasn’t able to recover, patch the hole with sail cloth and limp into the creek next to what is now known as Cooktown, Terra Australis would have had a different fate. No Joseph Banks to lobby Aussie as a great place for a penal colony and no English colonisation. Maybe the French would be here, maybe they wouldn’t colonise, just “run” the mining tenements and “manage” the natives like it was a big Vanuatu. Whichever, if Cook screwed up a little more than he did, none of us would be here now. 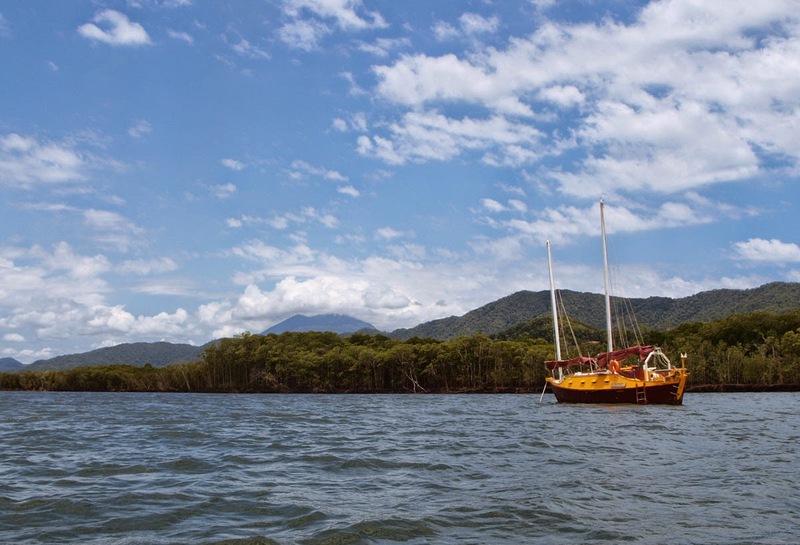 A couple days later we were motorsailing up the Daintree River where we spent Susie’s birthday. The gods tried to serve up a birthday present, because overnight a 4kg snapper jumped into the dinghy and remained there. Alas, it was rigamortice rigid when I found it in the morning. We did explore the river by dinghy but failed to get to the rainforest walking trails. Really need a car to get that far inland. While in Port Douglass we met a chap who saw us sailing north of Cooktown, I remember a boat passing us 2 miles inside of us, it looked like a racing boat (it was). 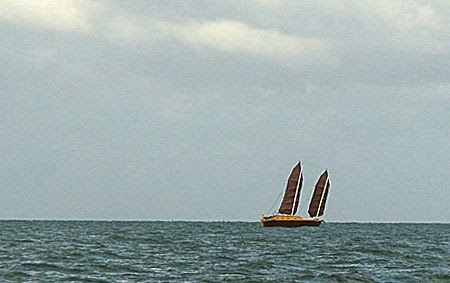 He said the crew were surprised it took so long to catch us, and how we were pointing so high to windward being a junk. We were doing around 4 knots hard on the wind to round Cape Flattery, which didn’t seem that quick, but faster than the norm of late. I didn’t see them till too late but looks like the junk rig left a good impression on them. But I’m getting a little suspicious of the hull, we have lost a knot in speed motoring and speed drops off dramatically when going from beam reach to a more windward course. She didn’t used to, she’d usually perks up a little when turning her bow towards the wind with the boost from apparent wind. I vaguely remember her sailing 5.8 knots hard on the wind off Mandurah.. Maybe there’s too much growth somewhere slowing us down, but I always scrape the hull near the waterline. 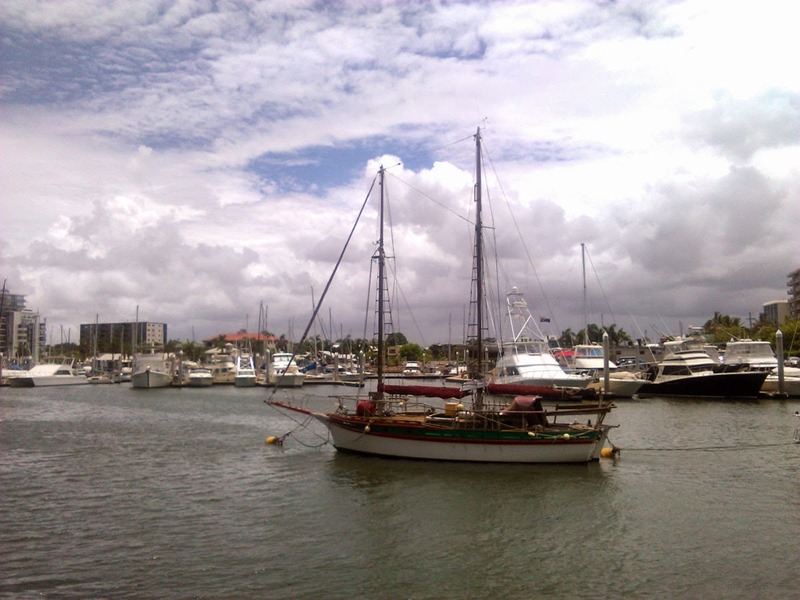 The day we left Port Douglas for Cairns may have been a little unlucky, because the wind turned against us and by Zeus a gale came upon us in the night. As well as being back to making little progress with the wind on the nose nonsense, the wind started howling and the ride got rougher. I was in my usual position, on the couch reading and about to get up to reef the sails when I saw Susie was already near the companionway. So I asked her to do it, drop a couple of panels each sail, thanks. She climbed out, I heard the can cleats snap a few times and she finished the job in 30 seconds. 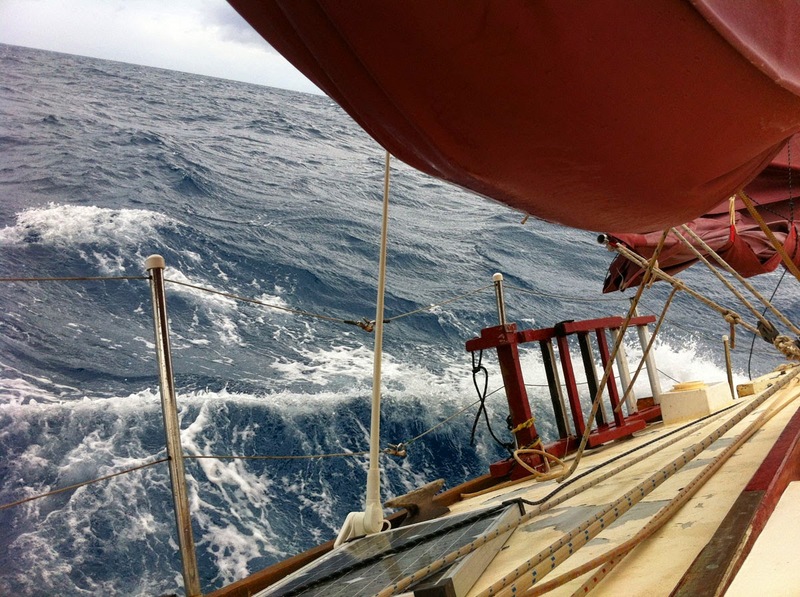 Both sails reefed, noise reduced, motion calmed, I never left the couch! Sometimes the value of the junk rig really pays off. The storm remained with us all through the next day. So that supposedly “short” 50 mile sail was a real pain, or maybe as some Aussie Prime Minister (almost) said, it was the storm we had to have. One positive about the hull, although it can get noisy with waves crashing into it, like solid thuds, there’s no creaking or groaning sounds. That’s what we hear, solid thuds as if the entire boat was one solid object (as it is, all epoxied together). We must have built this thing right..
Cairns was the realisation of 1) probably Queensland at is best and 2) this is the motherlode of cruising. 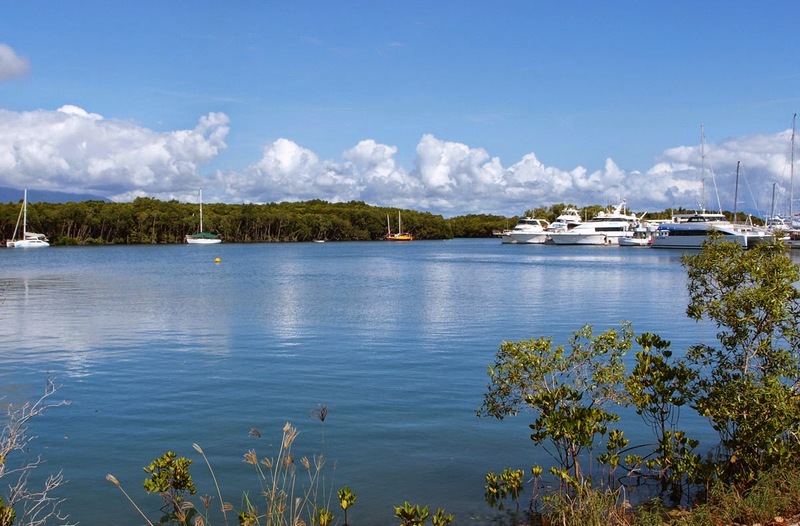 We hear QLD has all the nations cruising and live aboard yachts and the river packs about a hundred of them at anchor. 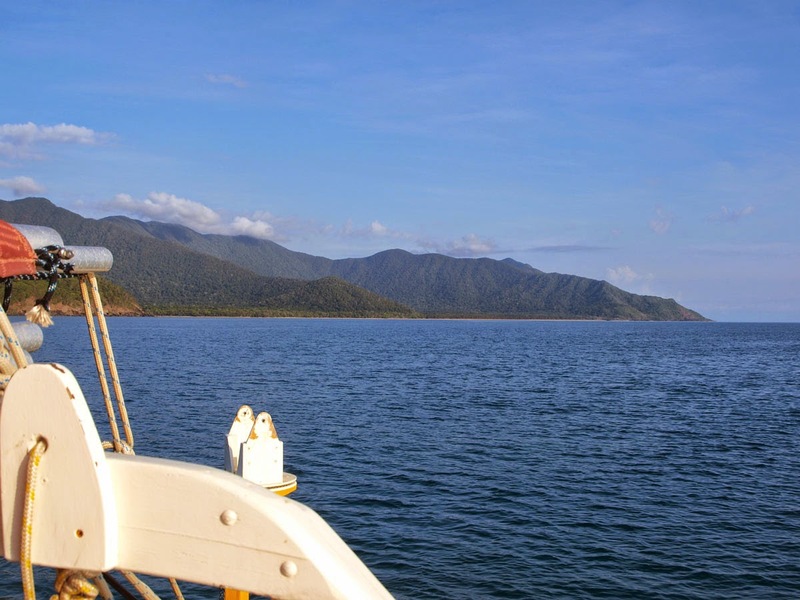 (Port Douglas and Cooktown were packed out too, must look hard for anchoring space.) It’s a big tourist town (& presumably a big party town - we wouldn’t really know, being aboard each night) with great atmosphere and cheap, choose where to have your $12 steak, with beer included.. Unheard of for us sandgropers. Speaking of anchors, I was still hauling up the anchor by hand since no lever had materialised yet. To top that off the depth sounder stops working 80% of the time, so we’ve been using a crude leadline, actually, an old pipe wrench on the end of a line to measure depths. So far in Cooktown and Cairns we have struck out in finding a piece of steel flat bar to use as a lever for the windlass. Thinking of installing a through hull transducer type sounder during the next haulout, the current one, which doesn’t work, is a “shoot through” type - it sits inside the hull and shoots through a wall of solid epoxy towards the sea bed. After a night at Fitzroy Island, a hideaway for Cairns locals, I had to resort to the handy billy (block and tackle) to get the anchor up, it was a deep anchorage. But 4:1 purchase of the tackle made it an easy job. Can lift anything with that thing, very handy to have on a boat. 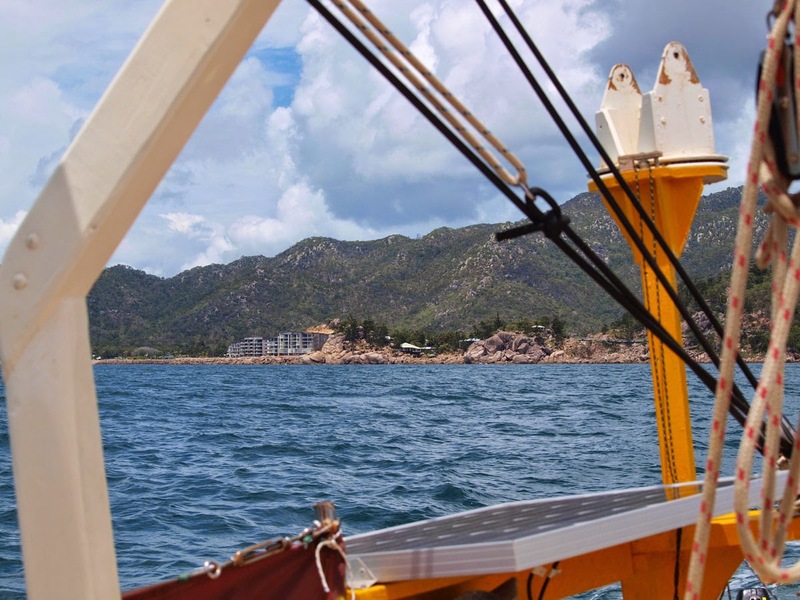 We had a dream run down to Magnetic Island, opposite Townsville, Ashiki holding a 5.5 knot beam reach for hours on end. I know from reading the old cruising books and speaking to sailors who’ve done ocean crossings that 100miles/day is common and often exceeded by small sail boats. In coastal sailing, the wind never stays around long enough. Ashiki would reel off 55 miles in 10 hours, then the next 14 hours are either light breezes or calms, only adding 30 miles to the total. So still, we never cracked the hundred in our 3600 miles to date. Closest was 98 miles coming out of Carnarvon in WA (the opportunity was there to go well over 100 but that night we reefed right down to go 2 knots so the windvane steering could cope while we slept). The difference is, I’m told, is that the ocean trade winds blow 24 hours and those big daily distances should be no problem. This is a mountainous island covered with pine forests, Hoop pine to be specific - one of the few marine type soft woods native to Australia, the other being Huon Pine in Tasmania - far superior but is now unavailable. (If ever we wanted to build a solid timber mast, this is the place to come, just quietly slip in a fell a tree..). We anchored in the south end at Picnic bay the first day, when the wind switched to the SE we weighed anchor and headed for Horseshoe Bay on the Northern shore. 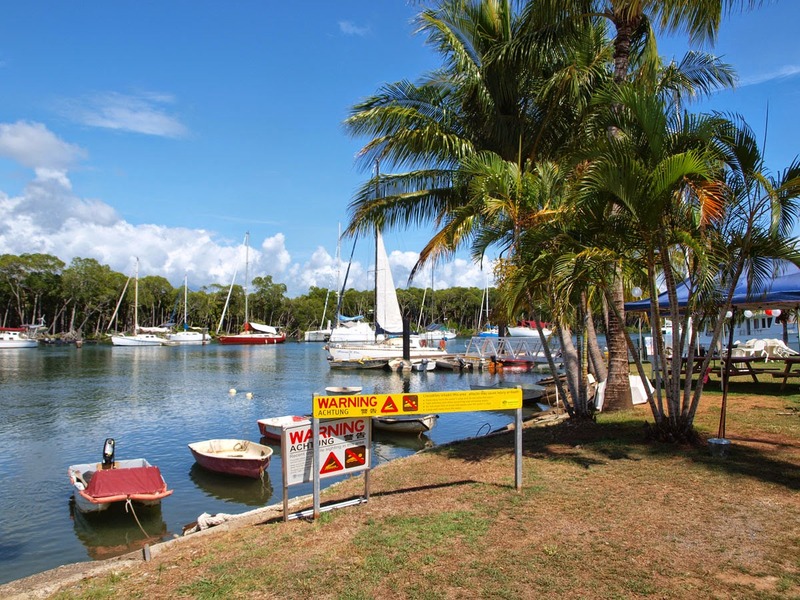 A perfectly protected anchorage with a lively holiday town on the shore. Just as well is was lively because we were stuck there for 10 days while gales were blasting over the hills from the SE. The only criticism of the place is cars. They let punters ferry them across from Townsville, thus we have traffic in paradise… Rottnest is far superior in this regard, being a no cars all bicycle zone. But in Magnetic’s defence, it is basically a Townsville suburb with private housing unlike Rottnest. 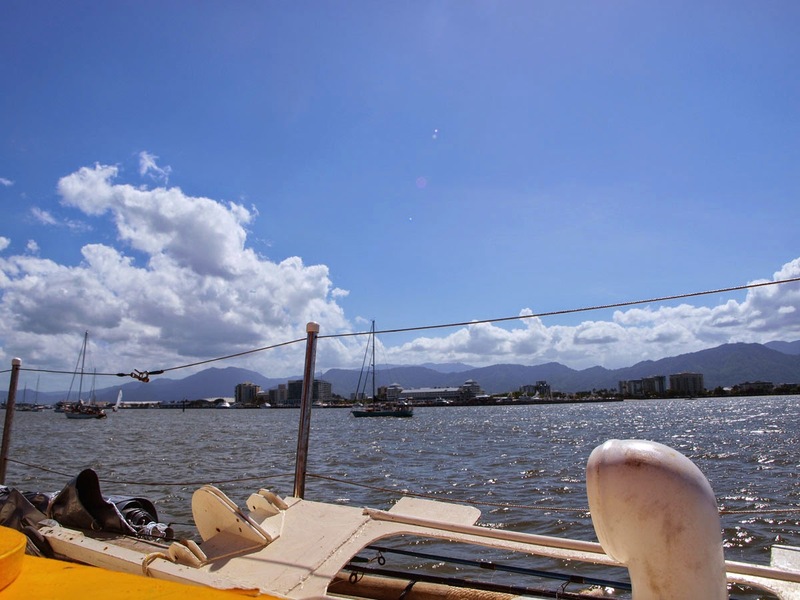 We spent a day exploring Townsville, a short ferry ride from Magnetic electing to leave Ashiki with her securely dug in anchor. 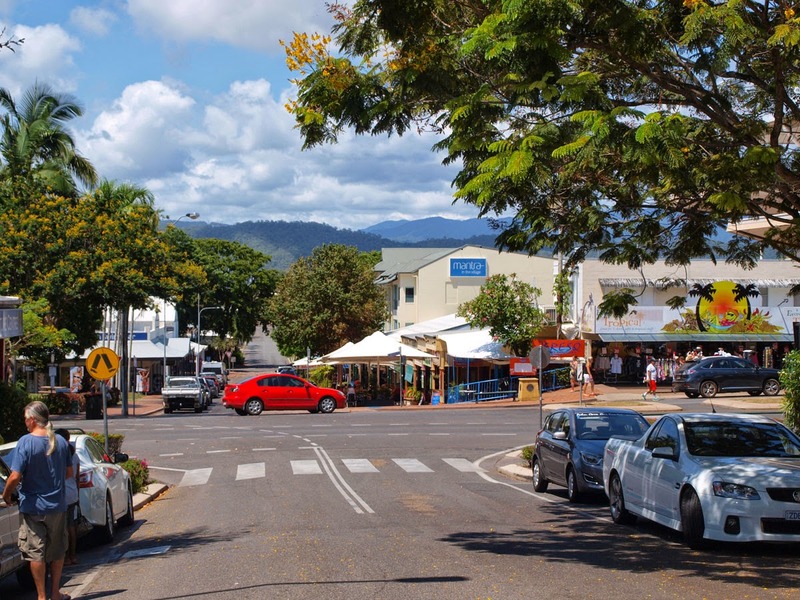 Townsville is clearly a working town as opposed to Cairns the tourist town. 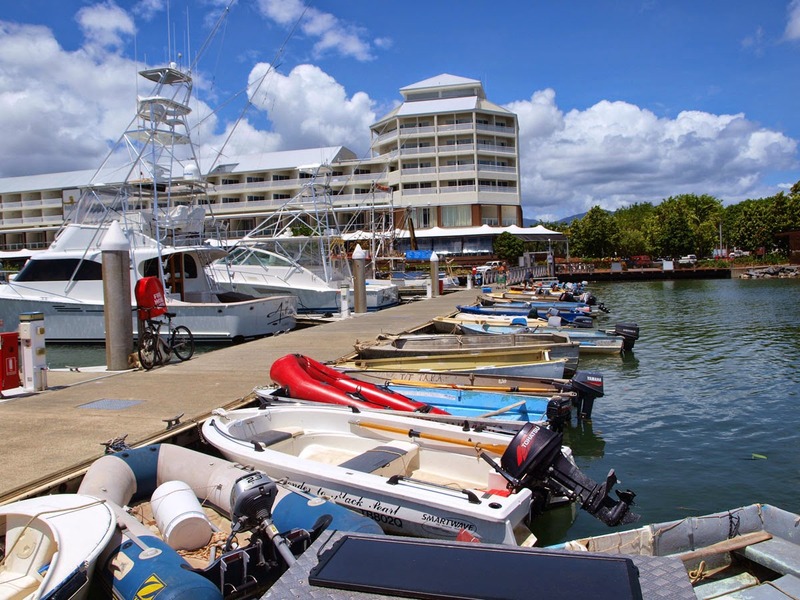 There are several large marinas and lots of river moorings in Townsville which I liked. But by comparison Cairns seemingly built from the ground up to please the casual visitor, has lots more to offer and more choice. Noticeably too, Cairns is very multicultural (Asian food rules!) while Townsville is closer to the Aussie norm. 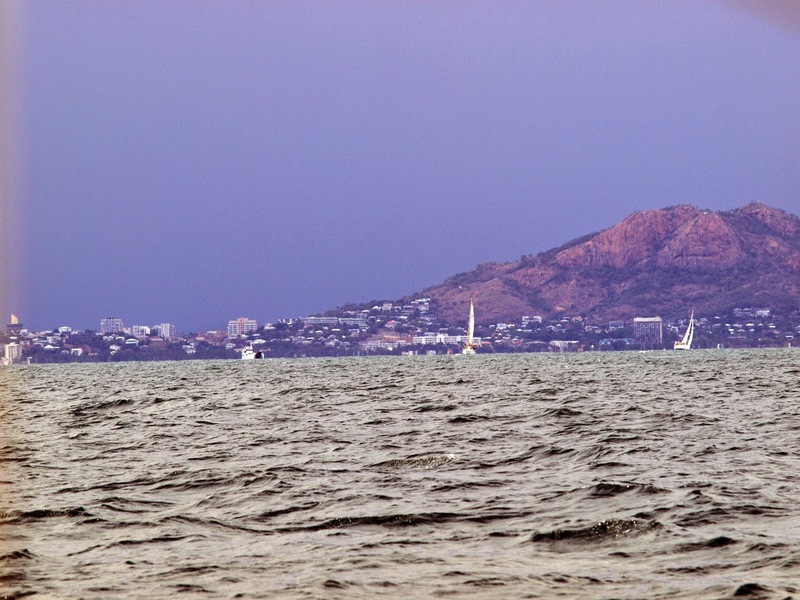 But Townsville does not cater well for the anchor out cruiser, the one anchorage called the “duck pond” is a long dinghy ride to the beach and questionable protection. The good news is, we found out about getting a lever for our anchor windlass. 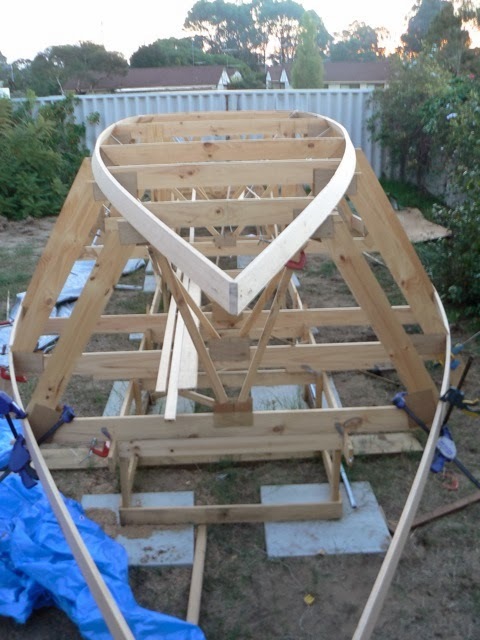 I was on the phone to a “Maggie” local who had a hire/tour boat business and built his own boats, thus had a workshop. Over the phone I gave him the measurements for our lever, made from steel flat bar (he had no stainless steel) and he delivered it right to us for $30 all up. You’re thinking that’s going to rust in no time, right? Well, I sprayed it with lanolin oil, that stuff dries to something like a thin plastic coating and left it out on deck in sea salt spray passages and it hasn’t had a spot of rust on it since.